Every year we breed thousands of fish to stock into rivers and still waters around the country. Up to half a million are used to replace fish killed in incidents, to improve fish stocks, and to develop new fisheries. Spring is a really busy time of year for me and my team based at our fish farm in Calverton, Nottinghamshire. Family life has to take a bit of a back seat as we’re on the road as early as 5.30am travelling around the country to collect fish to breed from. We always use wild fish as the quality of their eggs is better. 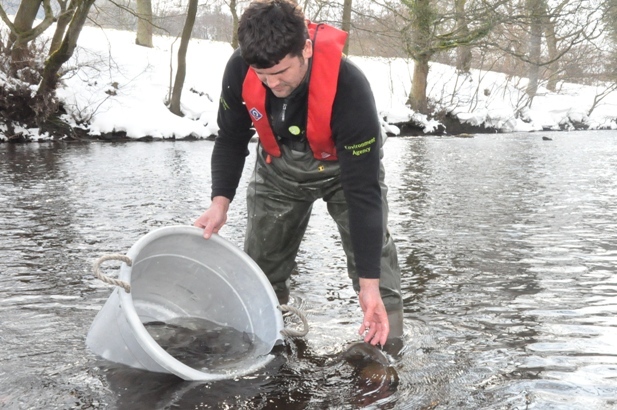 In the last couple of weeks we’ve been catching dace from the River Snail in Cambridgeshire and grayling from the Derbyshire Derwent and Yorkshire’s Wharfe, Ure, and Nidd rivers. When we arrive back at Calverton with the fish they are placed in tanks and injected with hormones. This mimics the hormone surge which happens naturally in fish at spawning time. Males and females are kept separately in warm water until ovulation takes place. The males and females are then dry stripped and the eggs are treated with a solution to improve the rate of fertilisation. After 10-30 minutes the eggs are gently poured into mesh trays and placed inside troughs, where they receive a regularly changing water supply. The eggs are incubated for between seven and 30 days depending on species and temperature. 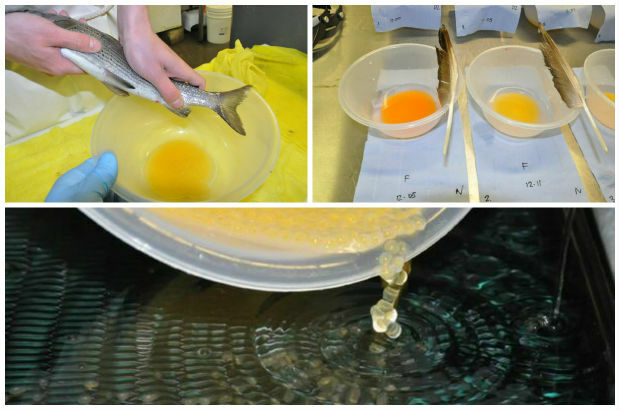 The eggs are stripped from the female fish, fertilised and then poured gently into trays. The adults are given a couple of days to recover and then they are all taken back, in tip top condition, to the rivers they came from. Last year it was a bit chilly as we were doing this and Rab got the short straw and had to wade into a very cold river! Alan Henshaw is the Team Leader at the Environment Agency's Fish Farm at Calverton in Nottinghamshire. His manager Louise Johnson tweets about their work. If you were catching fish on a river in the last couple of weeks you must have been fishing in the close season! I wish they could stock grayling in and around the Coventry area. I'm hoping to do my work based learning from hadlow college, with your good people at calverton. Which my head lecturer and his colleagues will be helping me to apply for with yourselves, in the next few weeks. Given good fortune and grace, it'd be fantastic to be able to assist and learn more about what you do there. I am a member of a small syndicate with access to a lake in Ringood area. It is 2.5 acres and has a depth range of approx. 1.6 metres at one end (damned) and .8 of a metre at the shallow end. It has several lily pads and much overgrowing bankside vegetation (marsh sedge) etc grass. It has a small number of carp and I put some true Crucian carp (50 7.5- 10 mm) on advice from peter Rolfe into the pond 5 years ago. I am a member of The Crucian Carp conservation group and as the small number of fish weren't sufficient to impact upon breeding I would be interested to know if the EA @ Claverton would be prepared to seed this lake/pond? can i buy grayling from you? We don’t sell fish to the general public. We only supply fish in-house as part of our statutory duties and these are stocked free-of-charge by our fisheries teams throughout the country. Hi, I have a surplus of small roach and Rudd. Would these be of interest to you FOC. Please either call our customer services on 03708 506506 or email into our enquiries team at enquiries@environment-agency.gov.uk . We would need further information from you so we will be able to contact our fisheries team in your area, for their advice.